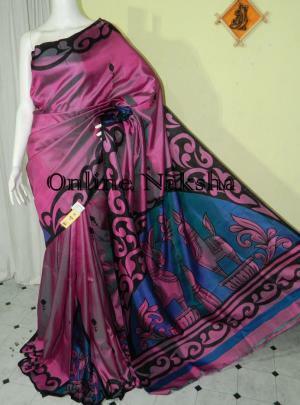 Buy Exclusive Handpainted Batik Saree Online. Full pattern of painting performed in a finest manner. This is a partly pallu Batik Silk Saree with a color combination of Tussar and Coffee. The saree is full with a fabulous soberness . The saree is designed with hand batik work border and all over batik paint on pleats and pallu. Art of batik painting Beautiful Nakshi drawing can be seen as Batik painting. 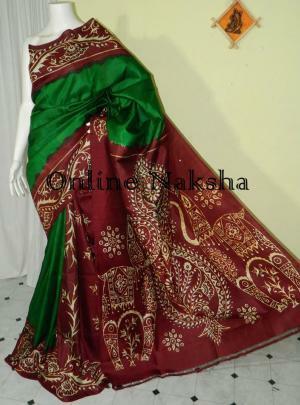 Online Naksha provide “Silk Mark” with this saree as a purity of Silk. Pick your favourite hand Batik Silk Sarees from the largest collection of Online Naksha | COD, Free Shipping.